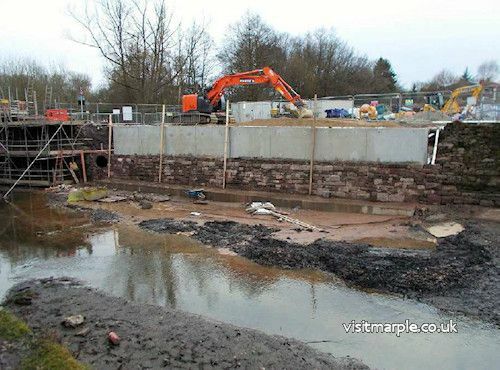 In 2012 approximately 20m of the stone canal washwall collapsed into the canal pond below Lock 7. 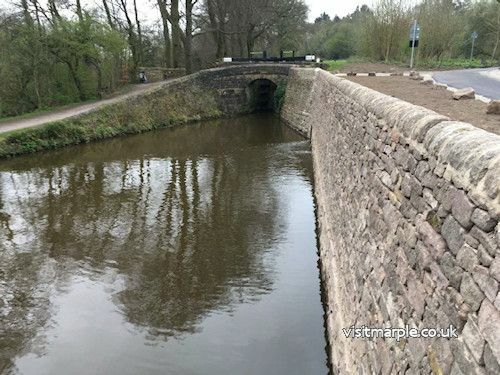 This page was added to the Virtual Tour of Marple Locks in 2017 using information provided by the Canal and River Trust following completion of extensive repairs to the wall. Canal bank collapse just below Lock 7 in August 2012. The work included a new reinforced concrete retaining wall, faced with reclaimed masonry. Almost 100% of the stone used was reclaimed from the previous wall. 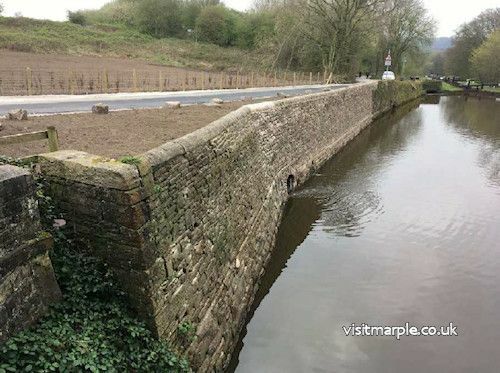 Tie-ins had to closely match the existing sections of wall either side and the by-wash outfall had to be reconnected next to the new retaining wall. New inlet details for the pond overflow were constructed, 2 new manholes and twinwall pipe were added underneath the road, with an outlet through the new retaining wall and masonry facing. Re-alignment and construction of a new section of road through the area was also completed. The work was done between January and April 2017. Following casting of the concrete retaining wall – February 2017. 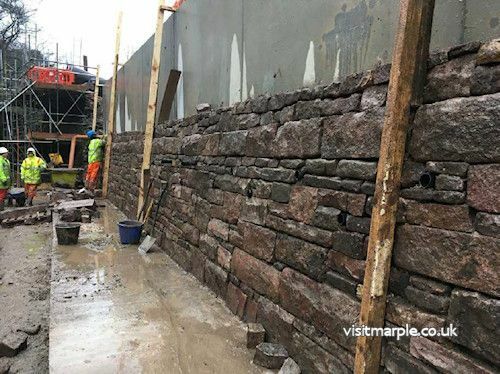 New masonry facing half way completed – February 2017. Close-up of new masonry facing in construction – February 2017. 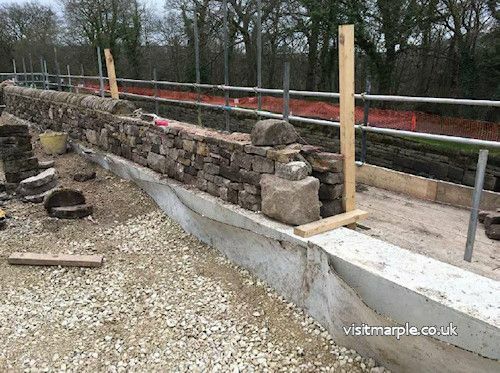 Top masonry parapet in construction – March 2017. 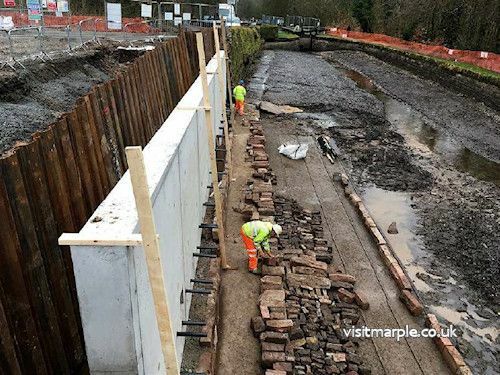 Masonry facing completed, prior to re-watering the canal – March 2017. Canal re-watered, view from Lock 7 – March 2017. 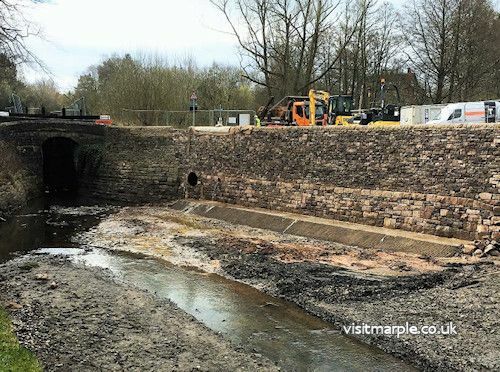 Canal re-watered, view back towards Lock 7 – March 2017. Collapse in 2012 - Louise Thistleton. All other images - The Canal and River Trust.